I just drew this chart on the fly. Imagine we're describing different kinds of people. 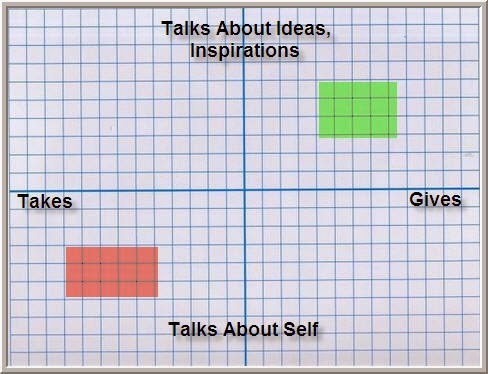 The Y-axis captures whether the person predominantly talks about the world around them, ideas, and inspirations vs. talks about themselves. That Y-axis also captures a positivity dimension: many people who talk about ideas are supercharged by those ideas. Many who are self-focused come from a position of need, even/especially when they are in self-promotion mode. The X-axis captures whether the person mostly wants things from you and is in a taking mode vs. a sharing/giving mode where there is back and forth and true reciprocity. I've color-coded the quadrants. I find that the upper right, green quadrant is one that renews my energy. The lower left takes quite a bit of energy. A big part of success and happiness is surrounding yourself with the people and things that give you energy and minimizing the things that deplete energy. This is especially true in one's romantic life. One reason I like the idea of creating your own trading groups is that you have the opportunity to generate an oxygenated work environment. It's amazing how much growth and learning can occur when you're around growing, learning people. It's much easier operating with the right internal, psychological environment if you're in the right interpersonal environment.